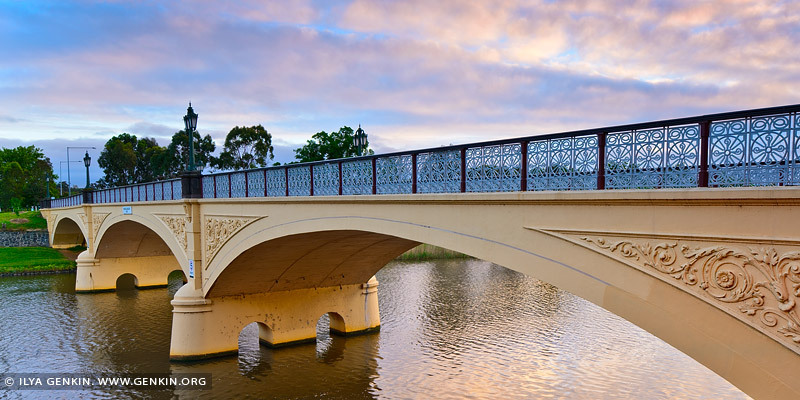 The beautiful Morell Bridge was built in 1899 and spans Yarra River in Melbourne, VIC, Australia. Completed by John Monash and J. T. N. Anderson, it is notable for being the first bridge in Victoria to be built using reinforced concrete. Located in a very picturesque part of the city, right beside The Royal Botanic Gardens, the bridge, which has also recently undergone a complete restoration, is closed to traffic and is now used as a pedestrian bridge. It features decorations on the three arch spans, including large dragon motifs and ornamental Victorian lights. The gutters on the bridge are cobbled bluestone, with a single lane bitumen strip running down the middle. The Bridge is listed on the Victorian Heritage Register. Originally known as the Anderson Street bridge, it was named the Morell Bridge in 1936 after Sir Stephen Morell who was a prominent Victorian businessman and Lord Mayor of Melbourne between 1926 and 1928. This image belongs to the travel and nature stock photo library. This stock photo of Morell Bridge at Dawn is available for licensing for commercial and editorial uses including websites, blogs, books, magazines, brochures and advertising. Restrictions may apply for images which contain third party copyrighted material or sensitive subjects. Photos of artwork are for editorial use only. This image id AU-MELBOURNE-0004 of Morell Bridge at Dawn, is copyrighted © by Ilya Genkin. This is not a public domain image.